As many of you know, I write historical suspense under the pen name, Anna Michaels. My first book as Anna received rave reviews and was called “amazing” by the late, great Pat Conroy. I’m thrilled to announce that I’ve just completed two more Anna Michaels’ novels, coming in one big package on January 8, 2019. 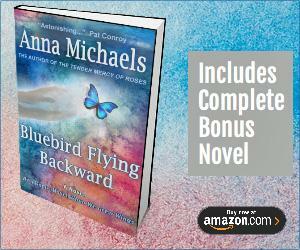 You can pre-order Bluebird Flying Backward now in eBook format at Amazon. Just click on the link in the ad on this post. For the amazingly low price of $4.99, you will get both Anna Michaels’ new full length historical novels: Bluebird Flying Backward and When We Grew Wings. On the pub date, the duo of novels will also be available as a trade paperback under one cover. The two novels are a total of 788 pages long, so you can cozy up by the fire and settle in for a long, leisurely read. Both novels grew out of my love of history. Bluebird Flying Backward is the story of a woman searching for her sister and will take you from the Jazz Age to the Lindbergh baby kidnapping. Early reviews say the novel is such a seamless blend of fact and fiction they had a hard time distinguishing fictional characters from the colorful cast of real people who paraded through what history called “the crime of the century” in 1932. I adore this novel! Every time I work with it, either reading to revise or edit, it touches my heart. I think it will touch yours, too. The second novel is set in the 1963 in the waning days of JFK’s reign, dubbed Camelot by historians. It showcases a mother looking for a miracle to bring her daughter out of her silent world of autism. Could the miracle possibly be a homeless teenager searching for her mother and her shaggy haired yellow dog? I love all the characters in this novel, the fierce mother and her amazing female friends, who will wade into any battle to help her rescue her child. And who doesn’t love a big, goofy, wonderful dog? The story is my homage to the Hairy Angel Foundation in Sedona, AZ, that supplies golden retrievers to children and adults with autism. It’s such a pleasure to bring these two hefty historical novels to you in one package! All through December, I’ll be having contests on my FB page as well as here on the blog. I’ll be giving away gorgeous tee shirts that feature the cover art of Bluebird Flying Backward, as well as other great prizes. You can click the link at the bottom of any page on this website to follow me on FB. Thanks for reading! Have a happy and safe holiday season.